. Published on Wednesday, March 7, 2018 . From our beautiful Arabian horses living on campus to the eye-catching point of the CLA building (Bldg. 98), there are many things that define Cal Poly Pomona (CPP) and set it apart from other universities. With all of our unique university traditions, it may seem daunting to attempt them all in your four (ish) years as a Bronco. That is why we have put together your Bronco bucket list, a guide to CPP-exclusive things you need to do before you walk across “the pancakes” to receive your diploma. You may have heard that the Bronco Recreational and Intramural Complex (BRIC) is home to the tallest indoor rock climbing wall in the California State University (CSU) system. While this is a fact we love to boast to all of our other CSU friends, you gotta talk the talk (or climb the climb) and try out the BRIC’s Bronco Peak. Campus Recreation offers Try a Climb, a free program for newbies to get a taste of climbing, climbing essential workshops including Lead 101, Technique and Movement, Anchors 101 and so much more. Have you ever gazed over to the hill with our brightly painted school initials and wondered if you could go up there? Well, you can! It is a short, but steep hike that you can conquer between classes. Just start in the J parking lot and don’t stop until you reach the letters! Still a little confused? You can watch a tutorial here. Join CPP’s College of Science in one of their monthly Star Parties, held on top of Building 8. Giant telescopes are set up on the roof so you can gaze into the sky to observe the stars and moon. This tradition is a must for space fanatics and those who just want to relax for an evening under the night sky. Join the next party every second Thursday of each month! 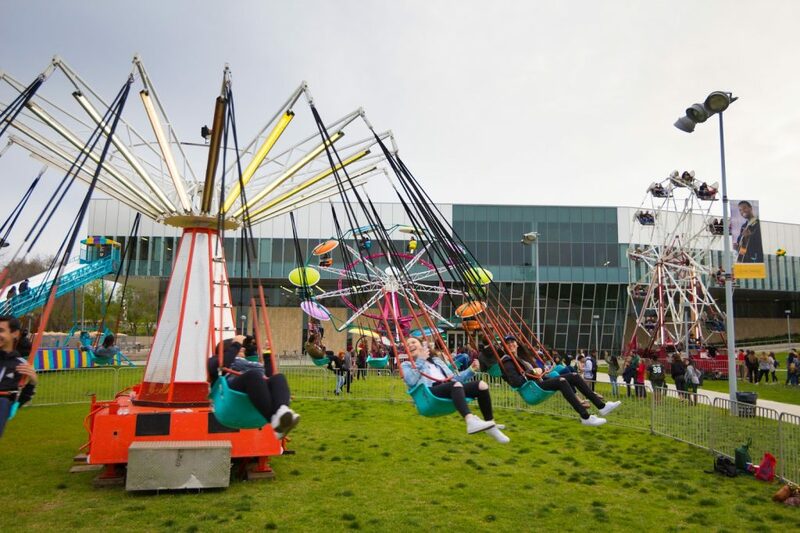 Petting zoos, carnival rides, fireworks, baseball games and concerts are just some of the past attractions that have graced Bronco Commons at Homecoming. Alumni, current students, staff and faculty are encouraged to bring their friends and family out to this day jammed packed with fun and Bronco spirit! Perhaps one of CPP’s most well-known traditions is the stellar Rose Float that our students—along with Cal Poly San Luis Obispo—decorate each year. Our Rose Float Club is filled with dedicated and innovative students varying in all majors. The work this club does is year-round, and if you’re not up for the time commitment, you can volunteer for decoration days that take place once the float is transported to Pasadena! A tradition created by W.K. Kellogg in 1926, our beautiful Arabian horses are shown off the first Sunday of every month. Take your whole family out to these exciting shows and enjoy, courtesy of our very own Arabian Horse Center. CPP students are admitted for free! Nothing beats $5 pumpkins, food trucks and corn mazes! Since 1991, The Don. B Huntly College of Agriculture has carried on this fall tradition at the AGRIscapes Agricultural Outreach Center (Bldg. 215) and The Farm Store at Kellogg Ranch (Bldg. 211). After the festival is over, the pumpkin patch stays open until Halloween! This is a fall tradition you can’t miss as a Bronco. Which Bronco bucket list item are you going to try before your time as a Bronco is up? Share with us using the hashtag #CampusCropChat on Facebook, Twitter and Instagram. Don’t forget to follow us on Snapchat @asicpp!